A cement mixer was Birdget’s most recent victim and yet another case of driver negligence. However the onus always seems to fall in the hands of City Engineering and Traffic to come up with a solution to this driver negligence. 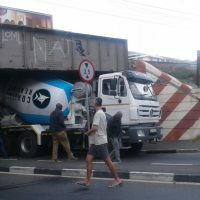 The cement mixer collided with the bridge at approximately 15h00 and was only cleared by 21h00! Adding to this, the risk to life as homeless people bed down for the night under the bridge . . . This “Truck Eating Bridge” in Atlantic Road, Muizenberg, has affectionately become known as Bridget over time and has her very own Facebook Page. It has a height restriction of 2.5m and to date has had countless vehicles get stuck underneath it despite the signs and height restriction sensors to WARN drivers of the 2.5m height restriction. In March 2013, a bus loaded with young children, hit the bridge. This bus accident resulted in 6 children needing hospitalisation and more recently, 2 passengers standing on a truck sustained head injuries as the truck passed under the bridge. In June 2016, the City installed their first 3D laser detection system at over R300,000 on Main Road, 150 m from the Atlantic Road intersection. It uses an infrared laser beam to read the vehicle height and load. If the vehicle is in the turning lane and higher than 2,5m from the road surface, a warning system is triggered at the intersection. A signboard with high-power LED lights flash to warn the driver not to proceed. Colliding with the bridge in Atlantic Road not only endangers lives, it also causes significant damage to City infrastructure and deployment of human resources at the cost of ratepayers, and results in unnecessary traffic congestion in an area that has limited capacity to accommodate alternative routes. We have no short-term solutions, even though many suggestions have been made by various stakeholders and community members. The unfortunate reality is that UNTIL companies and drivers are held FINANCIALLY accountable for the damages caused to City infrastructure, “Bridget the Truck Eating Bridge” will continue to munch away at the expense of the City and its ratepayers. If anything, one can appreciate that the Atlantic Road Bridge has been engineered, and built, to withstand a continuous onslaught of heavy vehicles crashing into it and getting stuck underneath it.